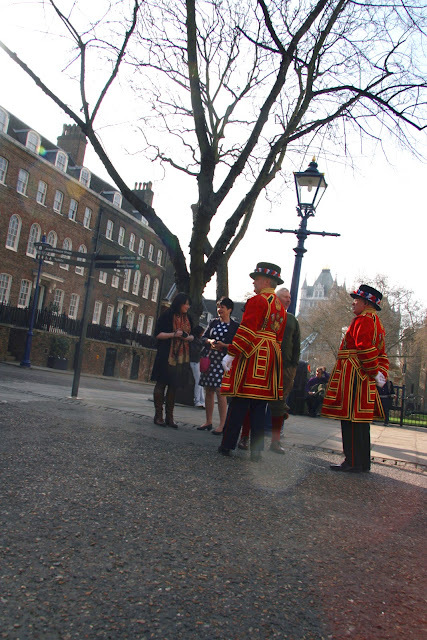 From the day we arrived in London, we patiently waited for our invitation to have tea with Her Majesty, the Queen. But it never happened. Let's assume it got lost in the post. But we didn't let that stop us from taking in the sights. And then it happened. One day, out of the blue, a royal sighting. It was at the Tower of London. It turns out we got there a little before the hordes. We felt like we almost had the run of it. That is, until, SHE arrived. Princess Anne! Charles' sister (we had to ask). Here are some of the guards, particularly dressed up for her benefit. Check out the threads up close. There's Spud in the background. Little did we know she was to come around that corner herself in a few minutes. But not until all three of us were over there ... looking for the "loo". When she came out the guards were a bit surprised to see us. They held us back (not physically, we weren't that keen) and we followed behind her, at a safe, commoner distance. 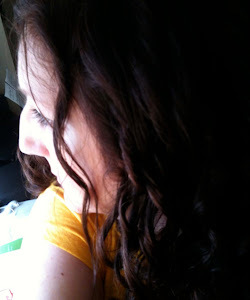 Here she is looking pensive (or is she trying to look interested) about whatever her friend there is reading to her. So why was she there? It was official business, of course. She was ceremoniously re-opening the new Crown Jewels display. Which we got to enjoy later. 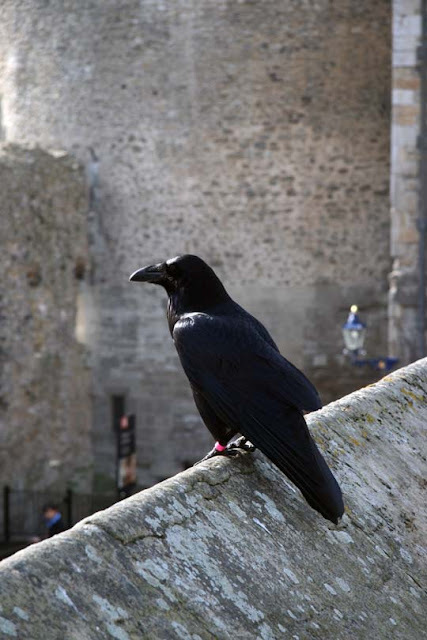 In the meantime, we learned about a local superstition around these noble black birds: "If the Tower of London ravens are lost or fly away, the Crown will fall and Britain with it" (source). This photo hardly gives the right impression on just how big these birds are ... a mere crow this is not! We think we saw 4 or 6 of them ... who knows. They try to keep a minimum of 6, I think. With one on reserve. You can't be too careful. Which, I suppose, is why they were releasing an additional one, in the presence of Princess Anne, after she finished with her duties. Job security. There it is in the cage ... waiting for "freedom". See that, it's practically up to their knees! 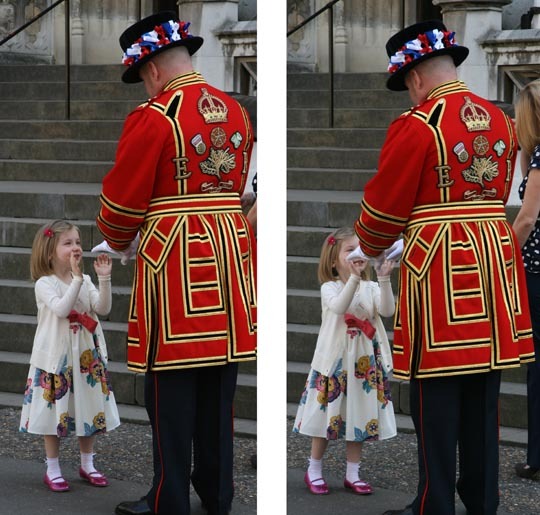 Along with us, there were a couple of little girls, waiting for the princess to wrap up some things so they could present her with some flowers. Well, it was all taking a little too long for this little sweetheart. 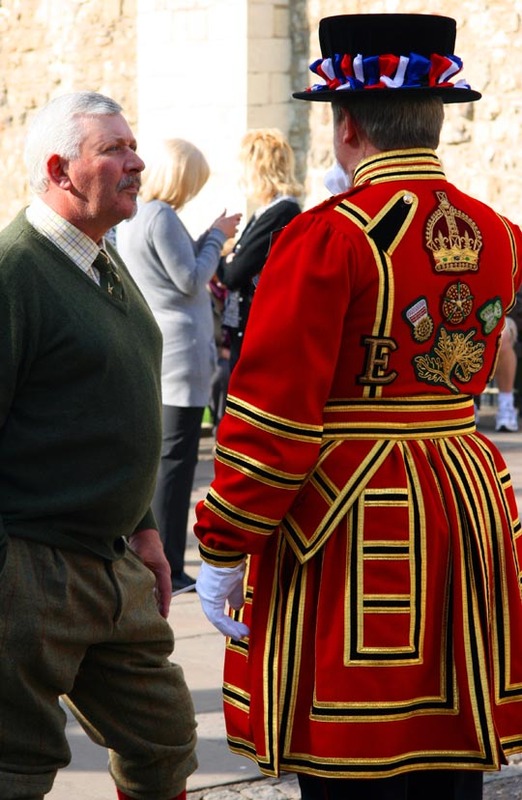 So what does the official royal guard do? He helps pass the time playing patty cake. Of course. 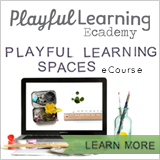 Thanks to Delicious Baby for hosting Photo Friday each week! My daughter would have loved to have had a royal sighting when we were in London even if it was just Princess Anne! 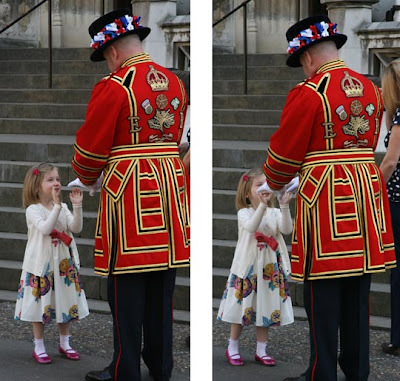 Love the guard playing pattycake with the little girl - so sweet! I'm so jealous! A royal sighting would definitely be one for my travel adventures.